When winter and spring duke it out they both end up looking silly, the dooryard fills with slush and streams jump their banks. Freezing rain gave way yesterday to sleet and ice pellets before turning to snow last night, which is when the lightning and thunder began. Another band of rain moved through with a shot of warm air and this morning felt positively balmy. 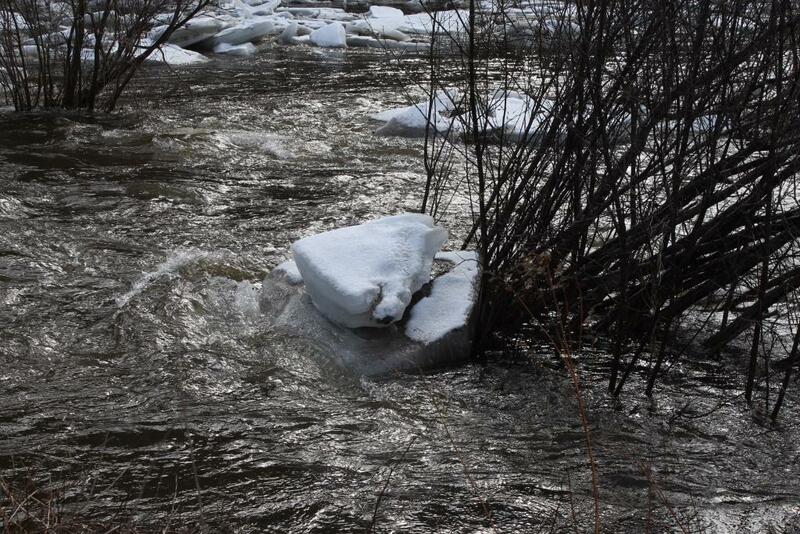 The streams are swollen again and the ice sheet has lifted as run-off flows in. Rain and snow melt that collected on top of the ice overnight has been pouring to the edges, draining through whatever holes it can find. Things are a little rowdier downstream today than they were on Monday. 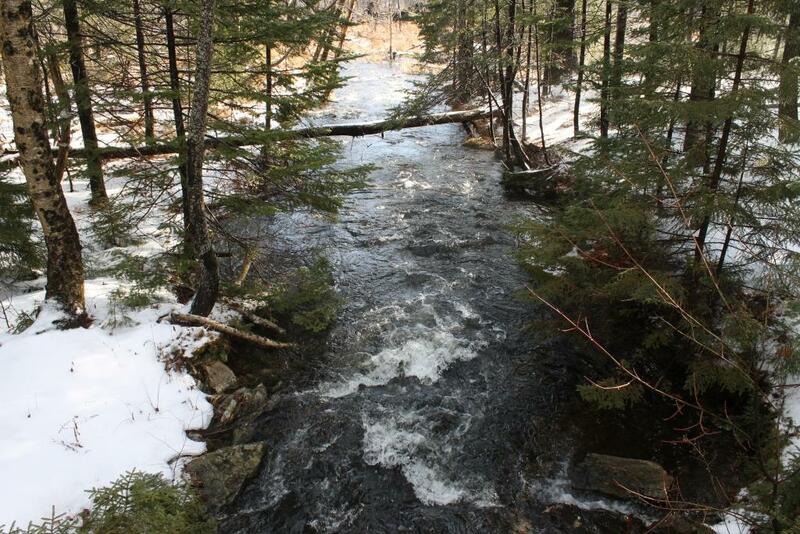 Another blast of cold air, due in this evening, might slow things down for a while, but it sounds like every brook, stream and rivulet on every hill is running bank-full. A dull roar in the woods, like wind, only constant. 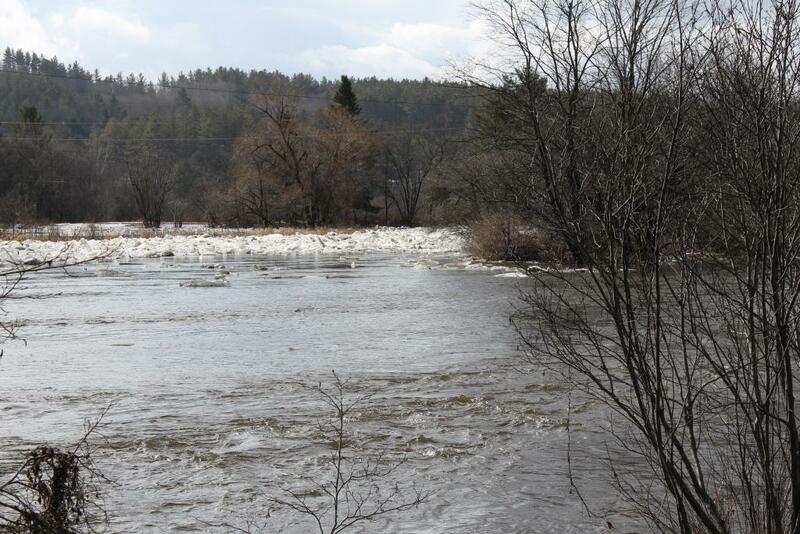 A quick trip for hardware and groceries took me past the ice jam of this past Monday’s post and, my, how things had changed. 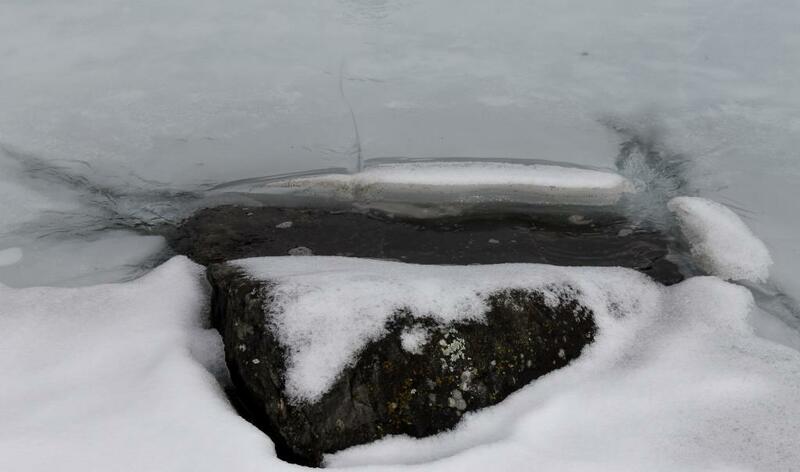 With the river bed clogged by ice slabs, the latest pulse of flow has to take a different route to get where it is going. 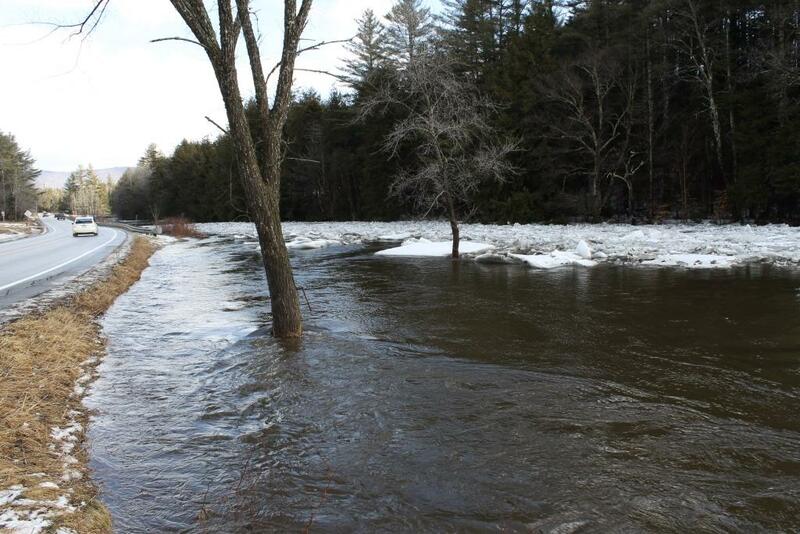 The mid-section of the jam gave way, with water and ice flooding a field. The FedEx driver just told me things have only gotten worse since this morning. 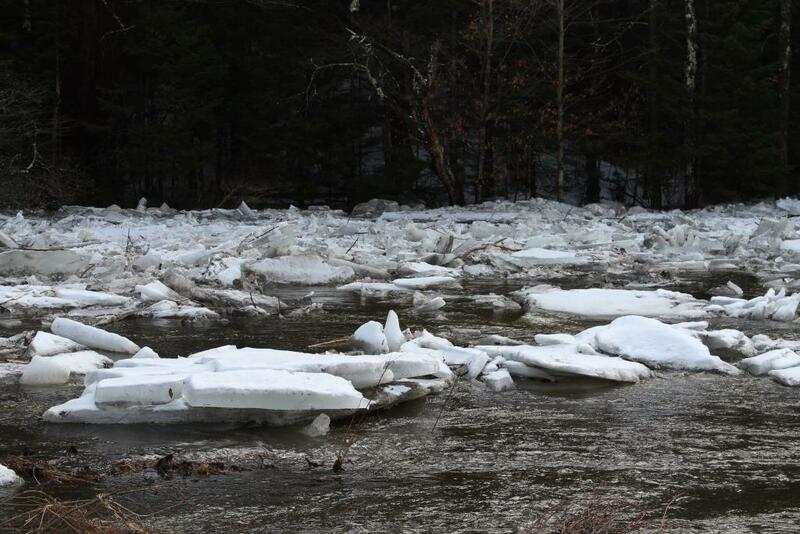 Ice jams popping up and letting go all over the place. As if water rushing over the roads was not enough, he said there are places where the water has receded, leaving big fat slabs high and dry on the center line. Now, that’s some winter driving. Makes me glad to live up on a hill. Haven’t seen a Frost Heave sign yet, and the roads haven’t been posted for Mud Season, so the best is yet to come. 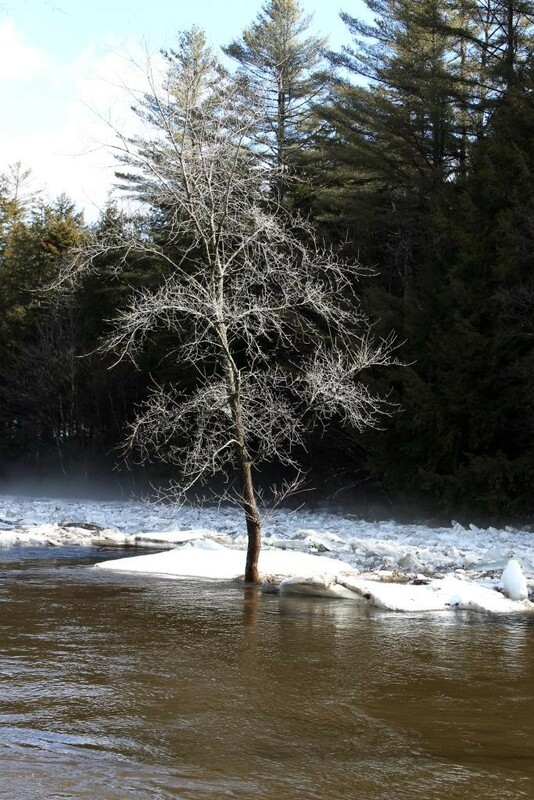 Some say spring defines Vermonters more than any other season but late winter certainly has its say. Buckle up and carry a blanket. It can be a wild ride. 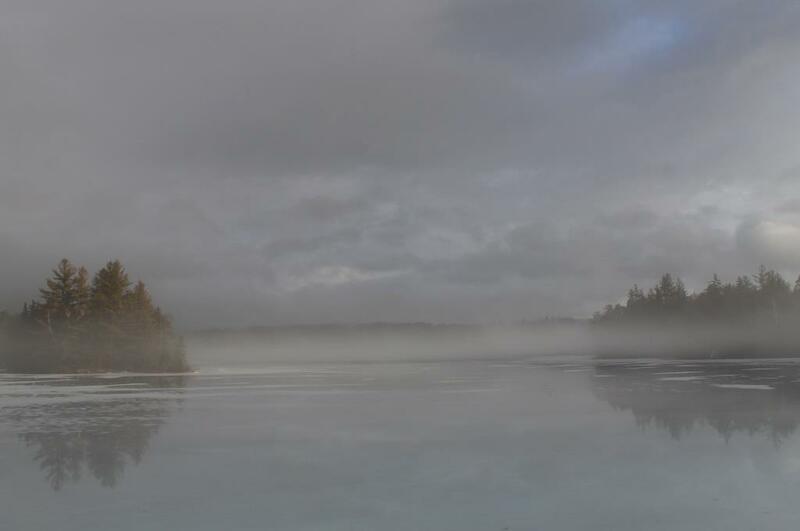 Ice sheet has lifted = bulged, elevated, raised. I predict the ice will be off before Memorial Day. That’s pretty bold, making a prediction like that! My, my…… you have a way with words! “Rowdy Runoff”. If I ever have twins, I will name them Rowdy & Ruly Runoff. I suppose that means I need to change my last name. Hmm…… no. Maybe I will just get two Golden Retriever brothers.